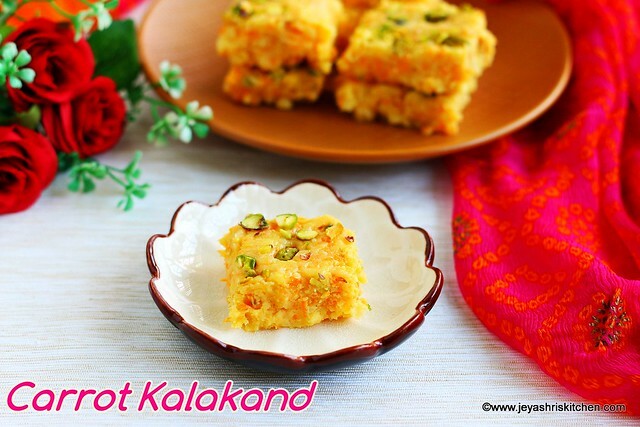 Gajar kalakand | carrot kalakand, is a quick and easy sweet made with paneer, condensed milk, milk powder and carrot. I have posted kalakand recipe from the scratch. Also i have posted chocolate Kalakand recipe using store bought paneer. 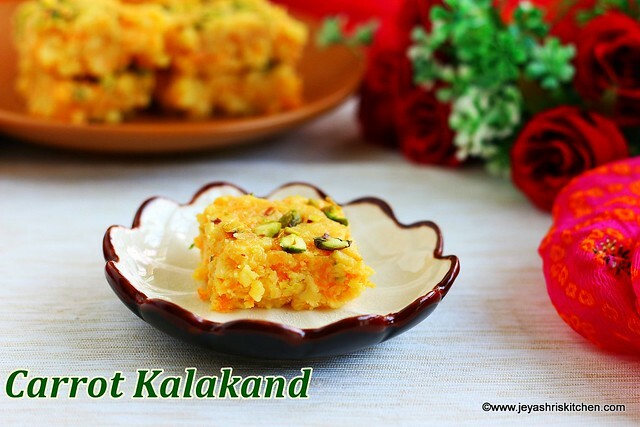 This Gajar kalakand i planned to post during Janmashtami itself, but couldn't post. Finally this easy kalakand recipe i made yesterday for deepavali. If you are running out of time, in the last minute and want to try out any sweet, do try this Gajar kalakand recipe. Check out my carrot burfi recipe too.Check Full collection of diwali collection from jeyashri's kitchen. In a pan add 1 tsp of ghee and add the grated carrots. Saute for 2 minutes and add the grated paneer, milk powder and condensed milk. Mix this well and stir this continuously. If adding cardamom powder add it now and mix well. Once it comes to a whole mass and leaves on the sides of the pan, add 1 tsp of ghee. The mixture will become thick. The entire process took 10-12 minutes in medium low flame. Grease a pan with few drops of ghee. Transfer the mixture to the plate. Allow this to cool completely and leave it for 2 hours. Cut this into squares with a sharp knife. This will stay good for 2 days, if refrigerated properly. I used store bought paneer. You can use home made paneer by curdling the milk. The sweetness was just perfect, but if you need little extra sweet, add 2 tblsp more sugar or condensed milk. Always cut the kalakand once it is cool completely. The texture will not be hard like burfi, it will be chewy.